Vilnius-based IM Interior has proven once again that great design doesn’t need a lot of space. The architects recently revamped an old garage in the Lithuanian capital into a stunning micro home clad in a weathered steel. 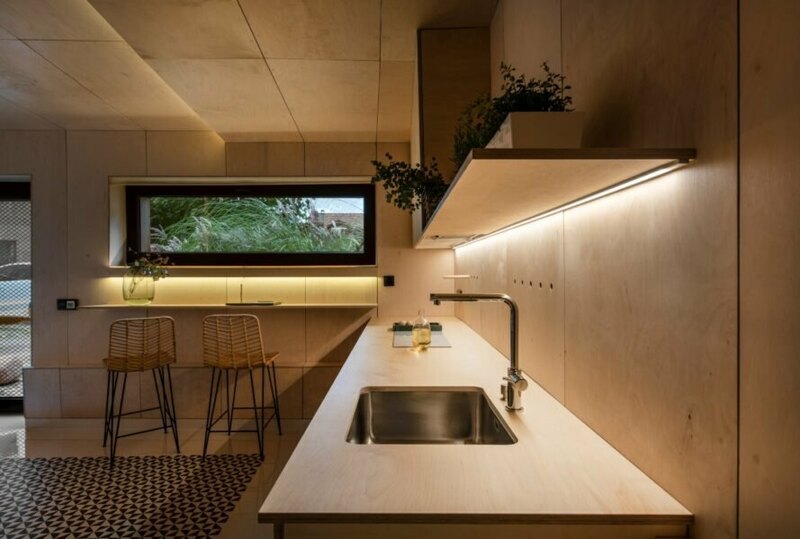 The 226-square-foot space was also completely made-over with a warm birch wood interior cladding and recessed lighting to create a modern and comfortable living space. 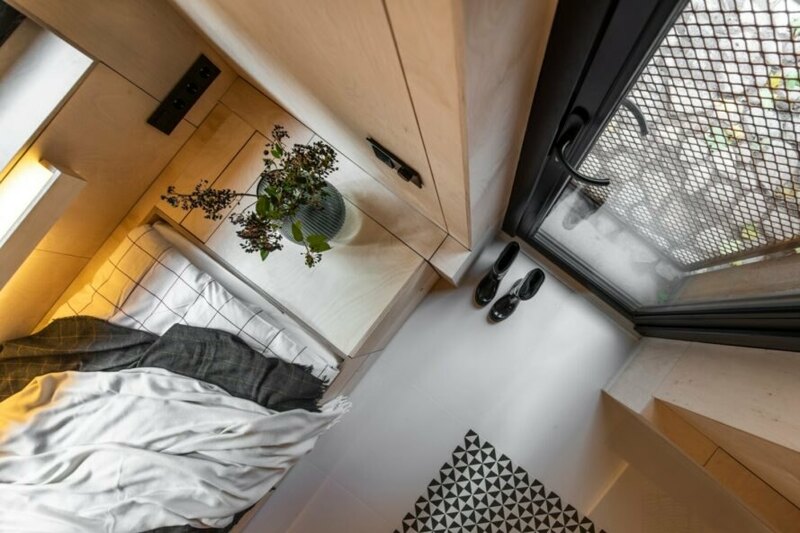 While many critics argue that micro housing is not a feasible solution to soaring real estate prices around the world, the micro home trend continues to grow, much to the delight of minimalists. 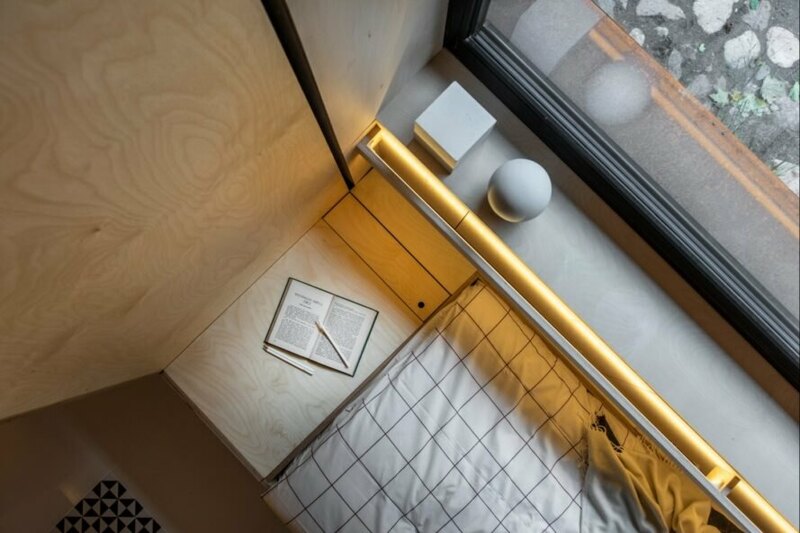 Regarding IM Interior’s recent project, founder Indrė Mylytė-Sinkevičienė explained that the inspiration behind the micro garage was to demonstrate another way of life. “I wanted to show how little a person needs,” he said. 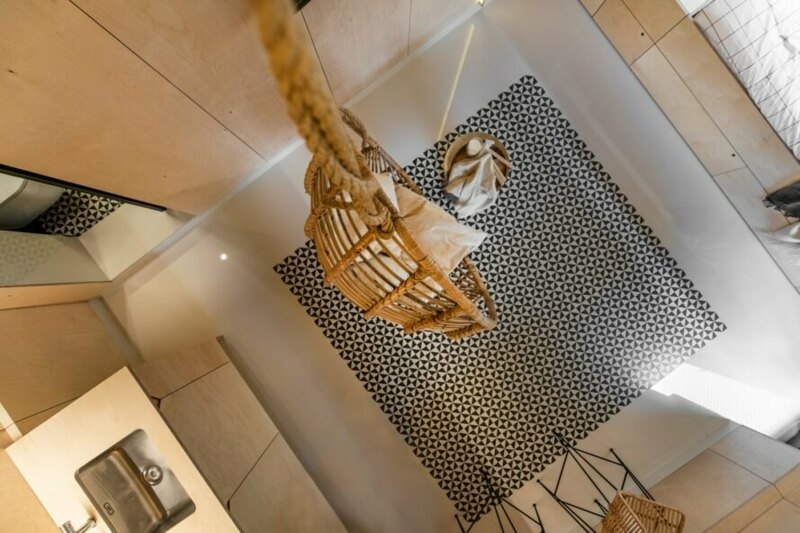 Located in the Lithuanian capital, the ultra tiny home was really built from nothing but a skeleton structure. 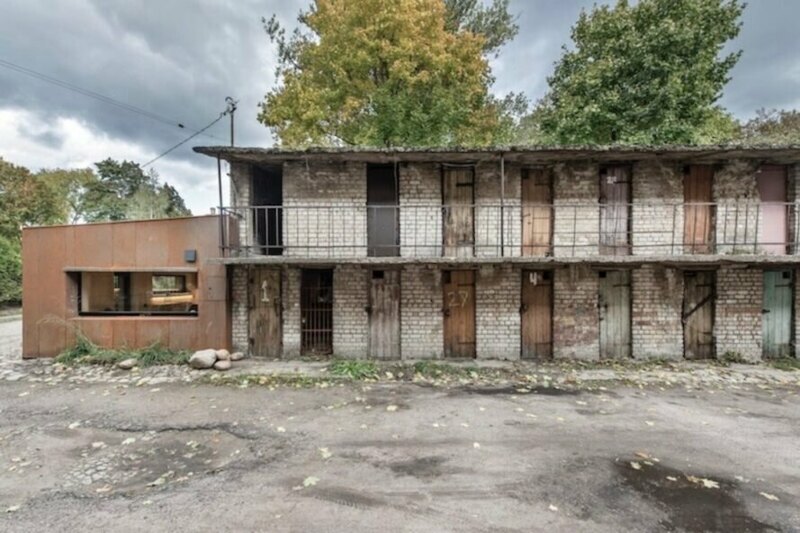 Connected to a dilapidated building that had been vacant for years, the corner garage was a forgotten piece of property. To breathe new life into the space, the architects clad the compact structure in weathered steel. They also added new windows and a new door to convert the empty garage into a truly comfortable home. Although the weathered metal exterior gives the design a cool, industrial vibe on the outside, the interior living space by contrast is bright and airy. The living area, dining room and bedroom are all located in one open layout. 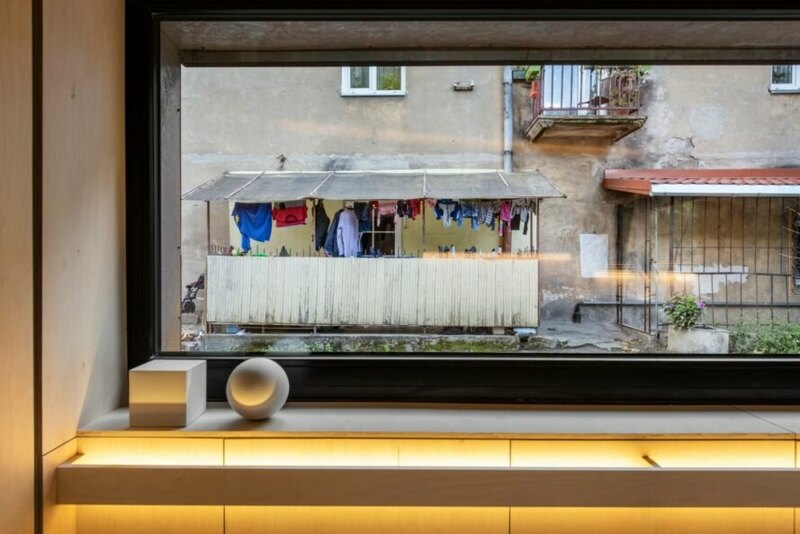 Two large narrow windows, one over the bed and the other in the kitchen, frame the urban views. 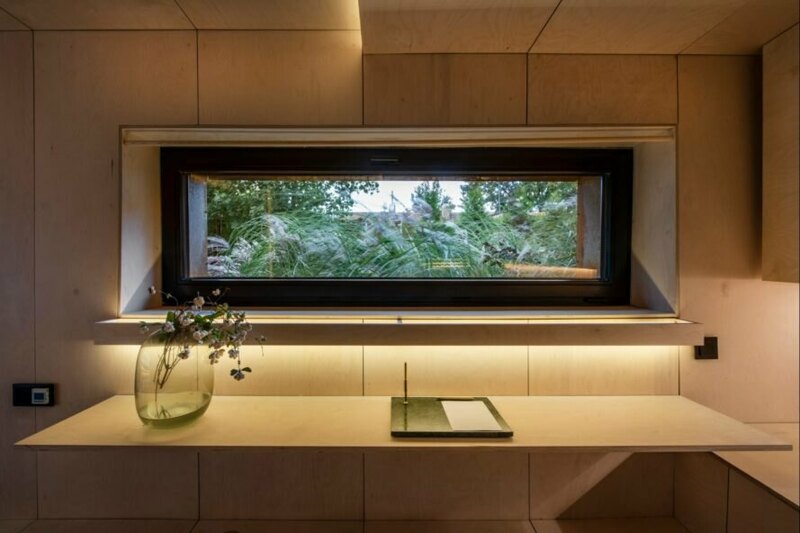 Recessed lighting was installed throughout the home, which is clad in warm birch wood, to create a soothing atmosphere. To maintain a clutter-free interior, custom-made furniture provides plenty of concealed storage space. Sitting under the large window, the bed pulls double duty as a sofa, which is also surrounded by built-in storage. Additional seating is found in the hanging wicker chair, adding a bit of whimsy to the design. Like most of the living space, the kitchen is clean and minimalist but was built with plenty of counter space. The bathroom, although quite compact, features triangular black and white tiling, further lending to the modern aesthetic. 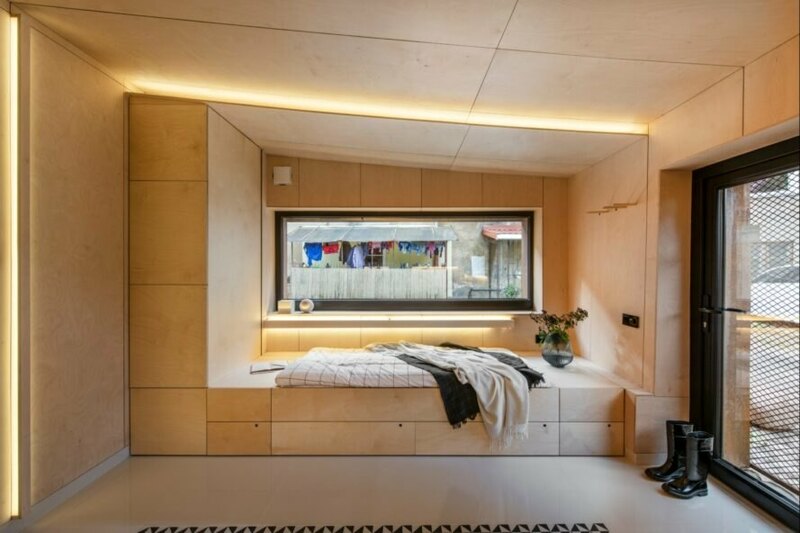 Vilnius-based IM Interior turned an old garage into a 226-square-foot micro home. The garage is located on a corner of a dilapidated building in Vilnius. The new micro home is clad in weathered steel. The modern, minimalist interior contrasts with the industrial exterior. Although compact, the living space is comfortable. Strategic storage was added wherever possible to avoid clutter. An abundance of storage space keeps clutter out of sight. Modern, sleek furnishings, like light wood cabinets, were chosen as part of the minimalist design. 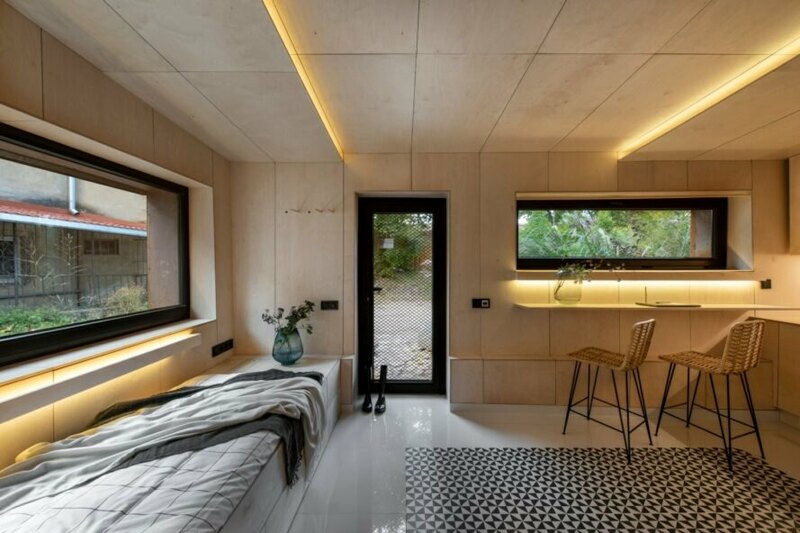 Recessed lighting and minimal furniture open up the living space. A large window in the kitchen brings the outdoors inside. Minimal furnishings, like a swinging chair, keep the space clutter-free. Recessed lighting was installed throughout the home. 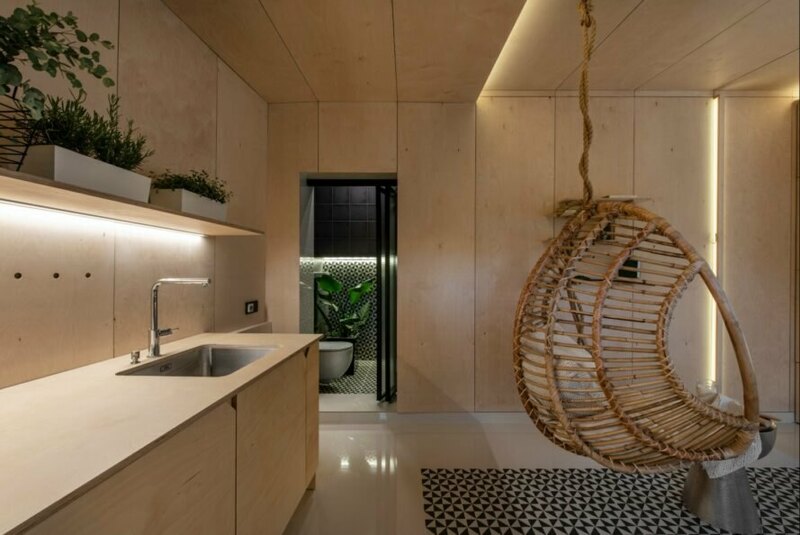 The swinging chair brings a fun sense of whimsy to the interior. The bathroom includes a black and white motif. Another large window over the bed allows natural light to filter into the home.